description — Distribution of the globally unique hexactinellid (glass) sponge reefs. Thank you for making this data available to the public. I was wondering if the other inlets contain these same organisums specifically Portland Inlet, Nasoga Gulf, Little Channel, Alice Arm and in the Chatham Sound? Apologies for our slow response to your question! Our notification system was apparently down but it has now been fixed. I have seen data within Portland Inlet but I am not sure whether similar glass sponge reefs have been observed in the other areas you mention. 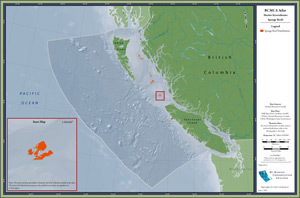 Geogratis provides bathymetric data for sponge reef areas but only those within Hecate Strait and Queen Charlotte Sound. 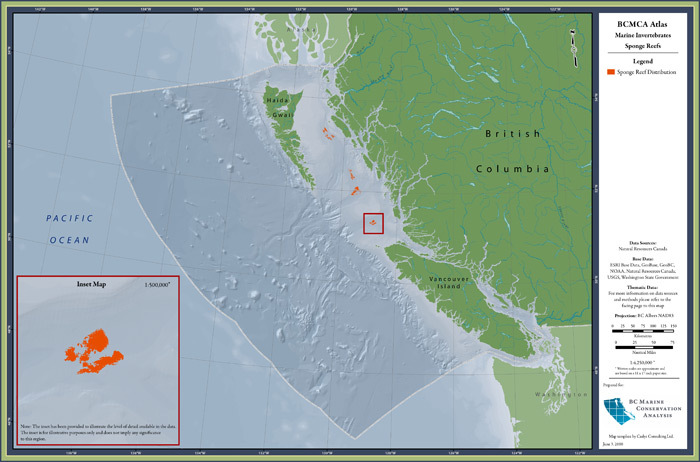 You might be able to find a bit more information in the references within DFO’s conservation strategy for corals and sponges: http://www.pac.dfo-mpo.gc.ca/oceans/protection/docs/cscs-pcce-eng.pdf. Otherwise, I would suggest contacting Natural Resources Canada or the Canadian Hydrographic Service as they are likely the best sources of information.